La Venganza! 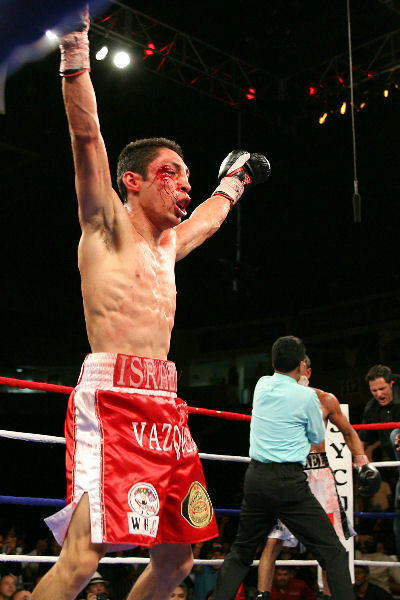 It was vengeance, vindication and redemption for a jubilant Israel Vazquez Saturday night on Showtime. Vazquez stopped Rafael Marquez in a rematch to regain the WBC Super Bantamweight world title that he lost to Marquez earlier this year at 1:16 of the sixth round in an old-school, classic and bloody slugfest. 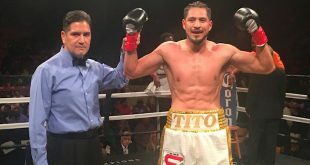 The main event of the Showtime Championship Boxing telecast from the Dodge Arena in Hidalgo, Texas had everything: tremendous offensive technique; non-stop, two-way action; a touch of controversy; and the contemplation of a third fight. In Saturday’s co-feature, a WBA Super Bantamweight world championship, Celestino Caballero retained his belt by unanimous decision over Jorge Lacierva in another action-packed battle by scores of 116-110, 116-111 and 115-112. 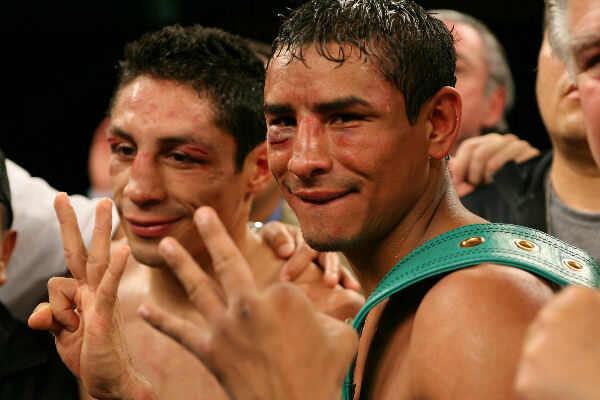 Marquez and Vazquez picked up where they left off in their first fight on March 3, 2007, which saw Marquez rally from an early knockdown to dethrone Vazquez at the end of round seven. That Fight of the Year candidate seemed to pale in comparison to the rematch as "Round Eight" began Saturday with the Mexican warriors going toe-to-toe from the start. 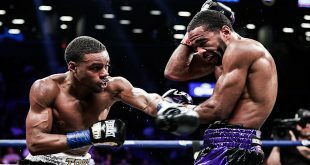 Both fighters thrilled the fans in attendance and viewers across the country with blazing speed, devastating power and an ability to take advantage of each others defensive openings. In the Round of the Year candidate third frame, Vazquez landed vicious left hooks to the body and head of Marquez, swelling and cutting his right eye. But Marquez fired right back with powerful overhand rights and uppercuts to open cuts near both eyes of his opponent. As combinations from one fighter landed, the other seemingly loaded up with a barrage of his own. "One of those old-time fights," bellowed announcer Steve Albert during third-round action. 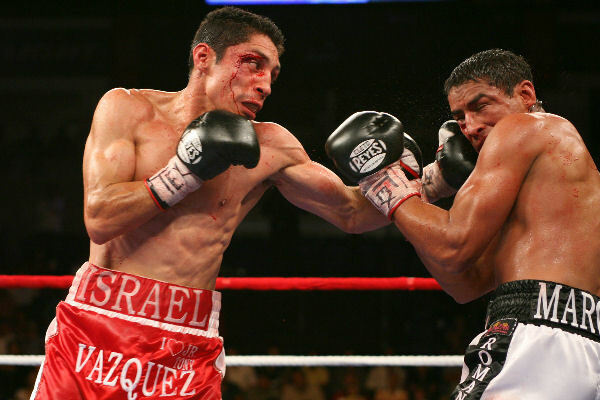 Early in the sixth, with blood flowing steadily from a deep gash over his left eye, Vazquez landed another devastating hook that sent Marquez to the canvas. A weary Marquez rose, shook off the sting and immediately engaged Vazquez. With the fighters trading punches along the ropes, referee Guadalupe Garcia stepped in to stop the fight. "I don’t understand," complained Marquez, who lost the first of his 10 career title fights. "I was throwing punches. I was able to fight. I don’t know why the referee didn’t see his eyes and think that he was hurt too." Said Showtime analyst Al Bernstein: "I am loath to criticize an official. My whole career I have been loath to criticize officials. However, I feel that this stoppage was premature. 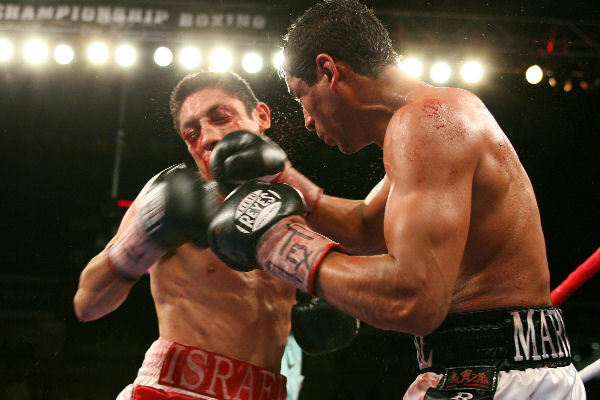 Israel Vazquez was superb tonight and may very well have knocked out Marquez later in that roundâ€”no question. However, I do feel that the Garcia stopped this fight too quickly." "It was only a matter of time," said Vazquez, 42- (32), who now has six KO’s in seven world championship fights. "I couldn’t finish him earlier because he is a great fighter, but if not (stopped) then, I would have finished him in the next round. I knew he was in trouble." Marquez lost his first fight in seven years and drops to 37-4 with 33 knockouts. "After the first fight, man-to-man, we told him we’d give him a rematch," said Marquez, 32, a two-time world champ. "And now, man-to-man, we want him to know we want the third fight." "It was an easy decision for me to stop this fight," said Garcia. "Marquez was in bad shape. He got knocked down, got up and was taking more punches. In this sport, the interest of the fighters is the best thing." 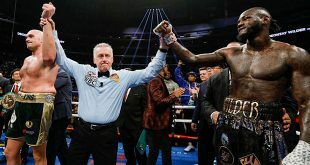 In the WBA title fight, referee Laurence Cole had his hands full for an awkward and tangled, albeit exciting, 12 rounds. The feisty, and much smaller, Lacierva (5’ 6") of Mexico City, took it to the champion Caballero early, winning most of the first six rounds. But Caballero, dubbed "The Towering Inferno" because he stands nearly six feet tall, was able to use his significant reach advantage to control the latter half of the fight. Despite repeated warnings from Cole, both fighters scrapped aggressively and pummeled each other round after round with blatant disregard for the rules and the bell. Elbows, forearms, heads and fists were flying as Lacierva kept machine-like pressure on his opponent throughout. Caballero, of Panama, improved to 27-2 (18) in his second successful title defense while Lacierva dropped to 32-7-6 (22). In between fights, fellow former world champions "Ferocious" Fernando Vargas and Ricardo "El Matador" Mayorga, who are scheduled to settle a bitter personal dispute on a September 8 Showtime Pay Per View telecast, were interviewed by ringside reporter Jim Gray via three-way remote (taped) from Los Angeles and Miami respectively. Both fighters were given the chance to discuss what set off a press conference brawl on July 11 at STAPLES Center in L.A., and their impending scrap. It is clear that tempers have not settled and both fighters are anxiously awaiting their next meeting Sept. 8, dubbed "The Brawl" by co-promoters Main Events and Don King Productions. Catch the replay of tonight’s explosive fights and the compelling interview with Vargas and Mayorga, on Tuesday, August 7, at 9 p.m. ET/PT (SHO Too) and Wednesday, August 8 at 11 p.m. ET/PT (SHO) or when available at SHOWTIME On Demand. Albert and Bernstein called the action from ringside with Jim Gray and Karyn Bryant reporting from the arena. The executive producer of Showtime Championship Boxing is David Dinkins Jr., with Bob Dunphy directing. Previous Risum Boxing Goes 3-0 In Nairobi!